I don’t write many posts that aren’t trail reports. However I get a lot of questions regarding pack weight for backpacking short trips (what to pack, how much, etc…) and I thought I’d create a log of what I bring, how much weight to allot, etc. Hope this helps (and let me know what works/doesn’t work for you!). Backpacking is a balance of going lightweight and being comfortable. Some people er more on one side, some on the other side. This is what works for me. Emergency Kit = 2 oz. Personal Hygiene = 8 oz. = total weight of about 19 lbs before food/water. For food, estimate a pound a day and for water, try and keep at least 2-3 lbs of water on you at all times. Survival essentials – ~ 16 lbs. Sleeping bag – Marmot Helium 15 (long) – 2 lbs 6 oz. Emergency Kit – 2 oz. Socks – 2 pairs of mid Smartwool PhD Socks – ~3 oz. Shoes – 1 pair of Salomon Quest 4D boots – 2 lbs 13 oz. Underwear – 2 ExOfficio boxers – ~ 3 oz. Pants – 1 pair REI Acme pants – 6 oz? 3 Hammer Gel Shots/day – 2 oz. 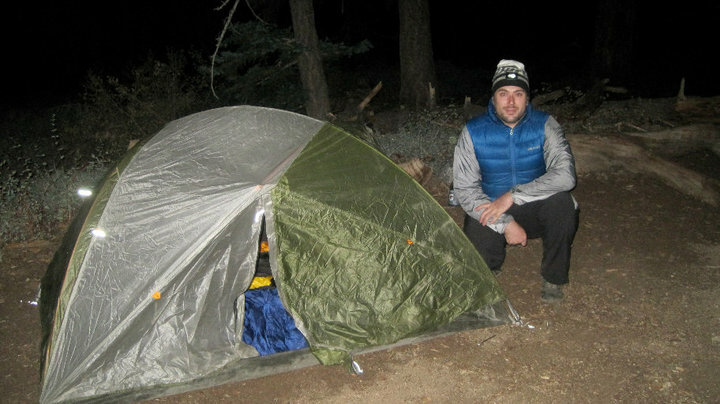 Posted on June 29, 2012, in hiking and tagged backpacking, bear vault, black diamond spot headlamp, bryan conant maps, bv450, camelbak antidote, emergency kit, exofficio give n go boxers, flash, gregory z35, Gu Chomps, hammer gel, hammer heed, jetboil, marmot helium, mountain house, north face mammatus hard shell jacket, quaker oats oatmeal, rei acme pants, rei lite core, rei quarterdome t2, rei revelcloud jacket, salomon quest 4d, sawyer squeeze filter, smartwool midweight top, smartwool phd socks, tom harrison maps, white sox hat. Bookmark the permalink. Leave a comment.